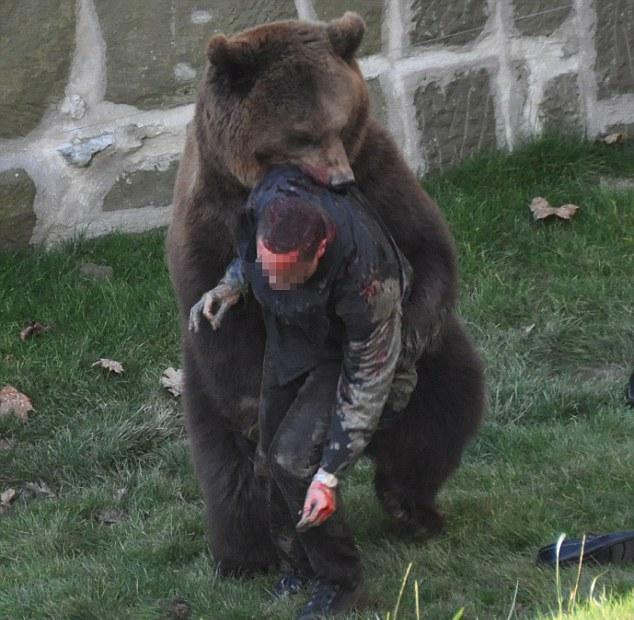 A man hangs in the jaws of a bear, seemingly about to endure a most horrendous death by being ripped apart by massive jaws and razor-sharp claws. But in the end it was the bear who ended up fighting for his life - shot with a police bullet in order to save the man's life. These dramatic photographs were taken by a visitor to the Berne Bear Park, Switzerland, at the weekend when European brown bear Finn, aged four, suddenly realised he had an uninvited human guest - said yesterday to be mentally handicapped - in his enclosure. The man perched for ten minutes on a 20ft wall above Finn's pit before he jumped in. That allowed worried park officials time to call police. 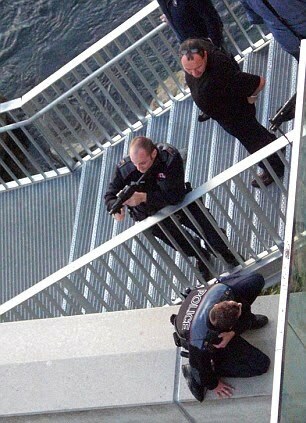 They arrived, armed with 9mm 'fragmentation' ammunition which splinters on impact, just seconds before the man jumped down into the danger zone. 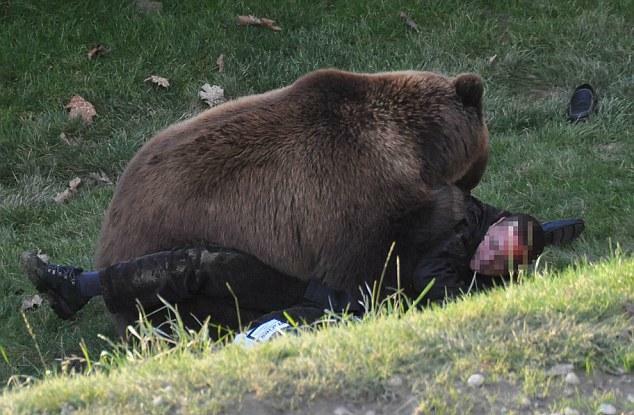 The bear quickly grabbed him. Finn picked up the intruder as if he were a rag doll, carting him to the other side of his enclosure, which opened last month. And as his massive jaws and teeth - capable of crushing steel - sank into his prey, police had to act fast. They were left with no option but to open fire, they said. Finn was hit with a single bullet to the chest. 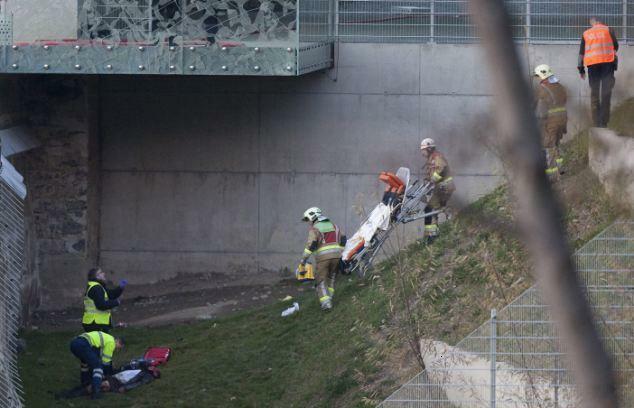 Police, ambulancemen and zoo-keepers rushed in. The man, who has not been named, was quickly taken away on a stretcher to a waiting ambulance. 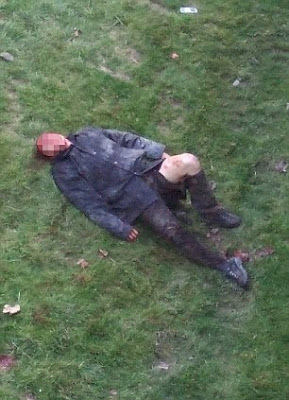 He was treated in hospital for severe head and leg injuries, and his condition yesterday was said to be comfortable. 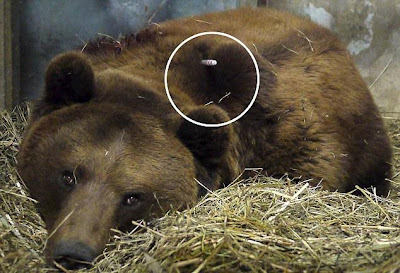 Finn meanwhile was treated at the bear park by vets who decided not to operate to remove the bullet splinters, treating him with antibiotics, to which he was said to be responding well. 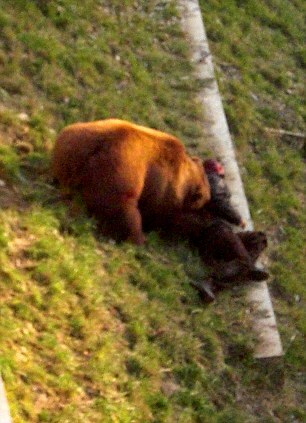 Bears are special for the people of Berne, being the city's symbol since the Middle Ages. Briton Sam Brookes, who was visiting the park with his girlfriend when the attack happened, said: 'I looked in after I heard people screaming. 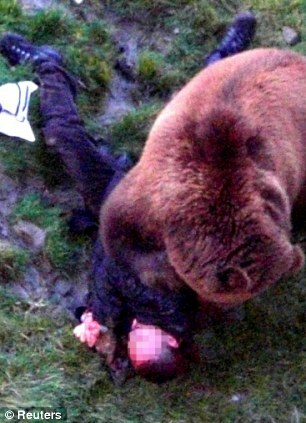 'The bear was standing over him and throwing him back and forth. 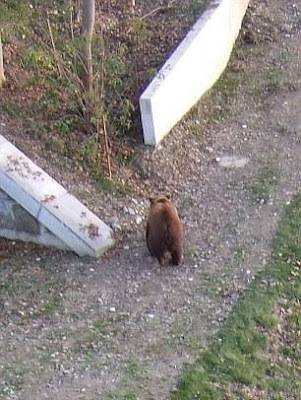 Police and zoo officials say there has been an outpouring of public sympathy - for the bear. 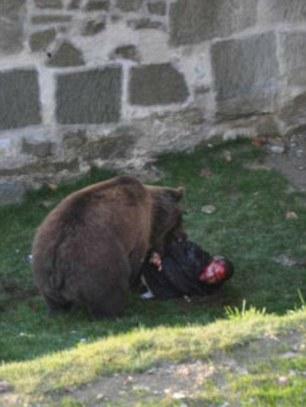 Bouquets of flowers and pots of honey have been placed outside his enclosure.